I’m an engineer by training, even though I don’t currently work as an engineer. What I’ve realized though, is that once you think like an engineer, you always think like an engineer. Everything looks like a problem to be solved, or a system to be optimized. That’s probably why my outfit photos are potentially boring on one hand (unposed, same front-right-left views over and over) but very consistent and easy to compare on the other. I’ve found that taking a photo of my outfit gives me an even more objective way of viewing it than looking in a mirror. Not that the way it looks in the photo is everything. When I’m deciding how I feel about an outfit, I also take into account how it moves, how it feels on my body, and how I feel emotionally when I’m wearing it. All of this hyper-awareness of my outfits has led me to a wardrobe that I am extremely happy with. It’s filled with clothes, colors and fabrics that feel totally me. OK – so let’s get started. How does an engineer figure out what silhouettes work for her? The first thing you need to know about the system you’re testing, is what the inputs are. 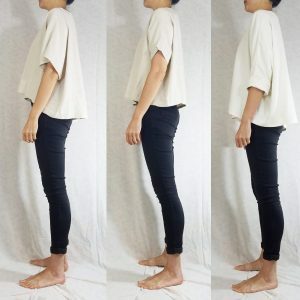 Somewhat defined waist — by measurement, I’m usually classified as either a triangle, because of my shoulders, or a rectangle because there isn’t a huge difference between my waist and hip measurement. But I do have a waist! 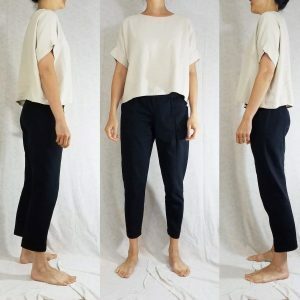 Proportions — if I go by Imogen Lamport’s guidance, I am a bit long in the chest, short-waisted, short-thighed, and long-calved (vs. ‘standard’ proportions.) Her guidance for those with shorter bodies and longer legs hits right on the money for several of the things I noted later in this exercise. If you do this exercise, just be objective and non-judgmental. This is a datapoint, not a reason to bemoan anything about the way you look. This is what you have to work with we’re going to treat it like a paper doll, dressing it in multiple ways to figure out what works. 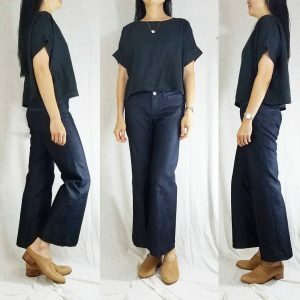 Why do sometimes feel like my skinnies are not the right proportion in an outfit, even though I’m following the loose-over-skinny formula that usually works well for me? 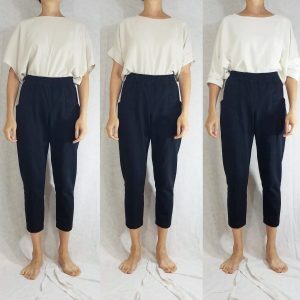 Why does it look so cool on other IG’ers when they tuck or partial tuck into high-waisted pants but when I try it, I feel like a stuffed goose? 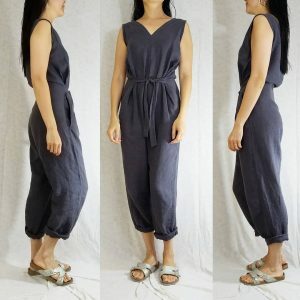 Why does it look ok if I define my waist when I’m wearing jumpsuits, but not with other outfits (back to question 2 regarding tucking)? How can I show-off the efforts of my workouts if I can’t tuck? Here’s the thing with skinny pants. Most of the time I wear mine, I’m totally comfortable and feel sleek and stylish. 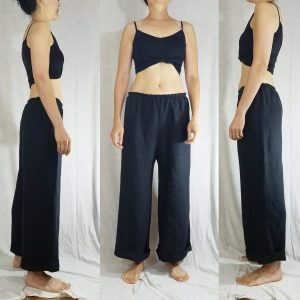 However, if the top I’m wearing is too short to cover my rear end, I sometimes get the feeling, looking at my outfit photos, that the proportions just aren’t right. 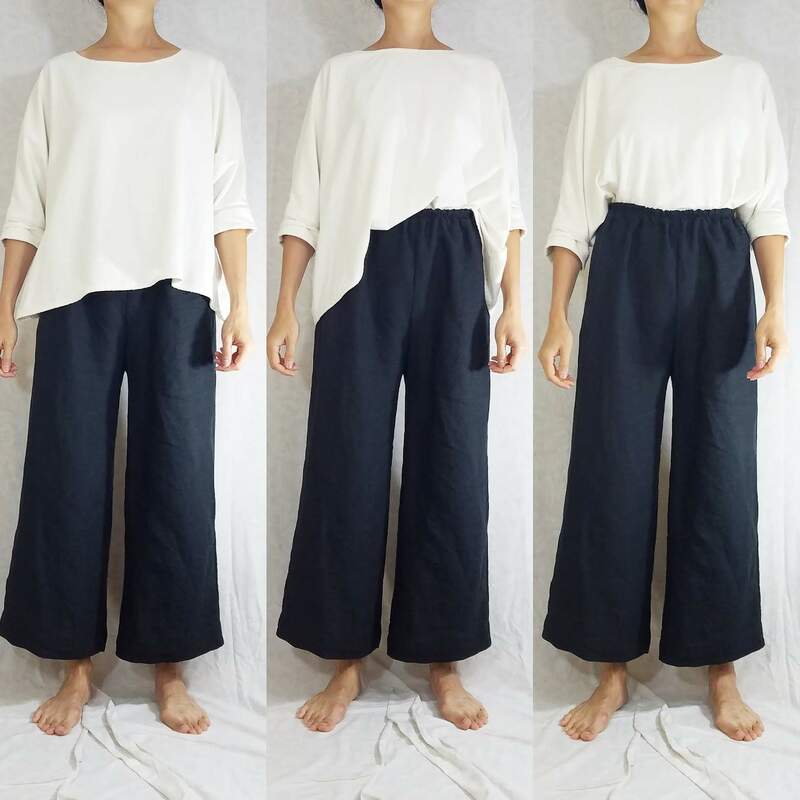 There’s too much of a contrast between the boxy top and the skinny bottom. I look like a fluffy cat who’s bottom half has been dipped in water. The thing is, I see other women pulling off this look with no issues whatsoever. I think the secret is the hips and thighs. I don’t have any. So when they’re totally exposed, it just doesn’t look quite right. Whereas a woman with more to offer there looks curvy, womanly, and in-proportion. I think all three tops look ok from the front, but from the side, the Georgia especially does not work. The Linn is iffy, which is probably why I feel ok sometimes, and other times not. And the T Top works fine. 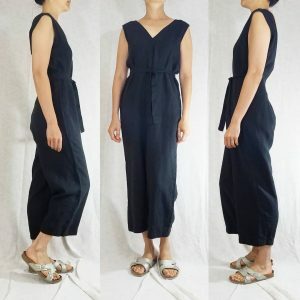 A top even longer than that (like my cashmere and linen tunics) work with no issues at all. What I learned: If I’m going to wear skinnies, the top has to hit past my bottom or lower. The Linn is borderline, so I guess I’ll determine by my mood that day whether to go with that combo or not. 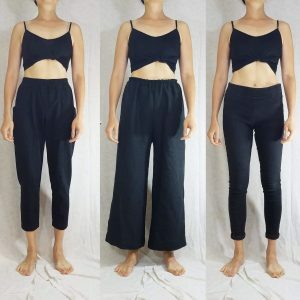 It’s funny I did the Imogen Lamport exercise for this write-up as she very clearly points out, in her guidance to those with my body type, that tucking doesn’t really work, unless you blouse out the top over the waist band to make the top look longer. The point is, if you are short-waisted, like I am, “your rib cage most likely sits almost directly on top of your pelvis with little gap in between, this is why you don’t have a defined waist, as there is no space to create one.” And it doesn’t work to create a horizontal line there as it visually highlights the disproportionate shortness. Still not good, even with just a partial tuck on the Linn. What I learned: In general, tucking doesn’t work for me (although I have successfully tucked traditionally cut blouses into pencil skirts.) 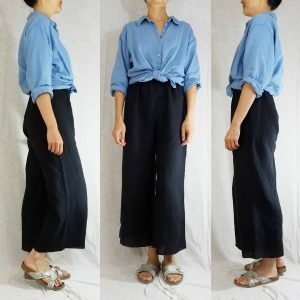 It especially doesn’t work with high-waisted pants and boxier tops. I’ll leave most of the tucking to the professionals on IG! Here’s the thing: I’m proud of my body. It’s 46 years old, has borne two children, and I’d like to flaunt the results of working out and eating well. While I love being a part of the #potatosacksisterhood, I also occasionally like to wear something that shows off my waist or booty. Those Clydes look good from the side, but aren’t working that well from the front. Between that and the too-short length, I won’t be keeping these, but will be thinking about sewing something similar that fits me better. 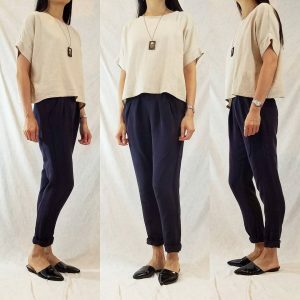 As Imogen mentions in her very helpful post, the best pants rise for me is mid or low. This mid-rise look, where my waist is visible, would be perfect if I were in the 1001 and Arabian nights. As it is, I guess it’s just a poolside look. 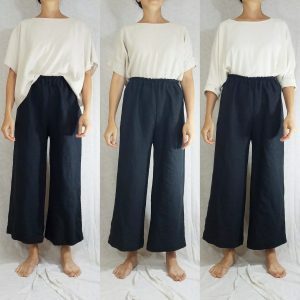 What about high-waisted pants for me? I’ll keep my high-waisted pants and just not show-off the high-waisted part. If I’m honest, I don’t love elastic waisted pants that hit there anyway. I often fold the elastic over and wear it around my hips anyway. I’ll just have to admire the cropped top / high-waist look on other IG’ers. Come up with a few questions you’ve always wondered about you and your clothes. Why does X look good on others, but not me? Why does Y always make me feel like a goddess? Etc. Take stock of your body type and proportions. I find Imogen Lamport’s guidance here really helpful. 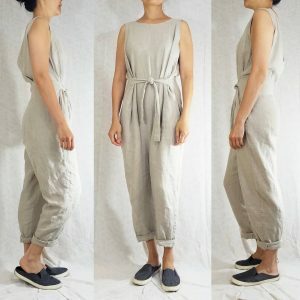 She has a ton of helpful articles on Inside Out Style blog. Gather up some clothing items that will help you answer these questions. I like that the items I picked were all similarly colored so that factor didn’t confuse the issues I was trying to solve for. Take pictures! This is really important. You need to take pictures and then look at them afterwards. Figure out that self-timer or voice activation on your phone and just do it. They don’t need to be perfect, and you obviously don’t have to post them anywhere public, but do take them! Use an app like Layout to place pictures side by side. It will help you test hypotheses if you can compare things directly. What works about this? Is it the pants length? 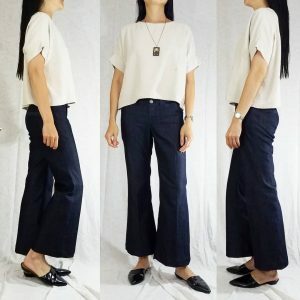 What if you try a different pants length? What if you look at it side-by-side with another cut? After you come up with your outfit tips for yourself, don’t be afraid to throw them out the window if something you wear makes you feel amazing! The ‘right’ outfit shouldn’t be about what other people thing is right or wrong, only what looks and feels good to YOU! Thank you for such an interesting read. I have been wondering what best suits me, so will be doing the measuring and reading required. You have a fabulous figure that you definitely deserve to be proud of. Thanks so much, Julie! Hope the analysis is as helpful to you as it has been to me! This is such a great exercise. I need to do it too. Although I already wear only a very limitted number of silhouettes I still have problems with many of them that look good on paper but not in real life. 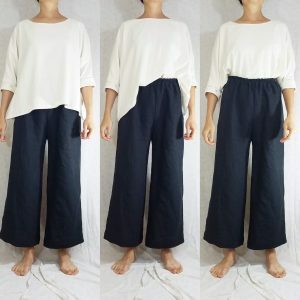 Like tunics I have had to give up: unless they are knee length at least, so basically dressy, they just look dumpy on me. 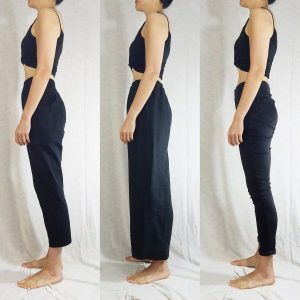 And I have the same problem with high wasted pants: I find them very hard to tolerate them on me–they feel weird. But it is true that once at the waist, they tend to stay there and don’t need to be pulled constantly like pants with a lower rise.